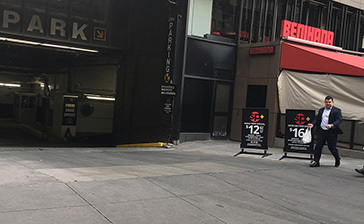 Looking for a parking near the Microsoft Store located at 667 Fifth Avenue? Parking.com offers several parking locations nearby. Discounts, daily and monthly rates are available at selected locations. 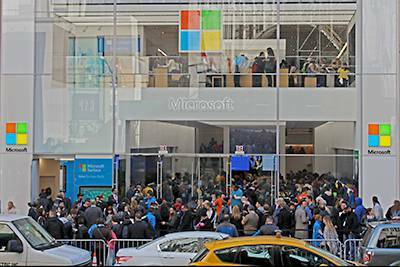 Microsoft's Fifth Avenue flagship store is located in the heart of New York City (677 Fifth Avenue) and is also one their largest retail store to date with 5 floors, 22,270 square foot storefront. Some in store products include Microsoft Surface Book laptops, Surface Pro 4 tablets, Xbox 360, Xbox One, the new Lumia 950 and 950XL Windows Phones and Microsoft Band 2 devices. A substantial portion of the second floor is dedicated to Xbox Entertainment. Some nearby attractions includes The Museum of Modern Arts, Trump Tower, Radio City Music Hall & Rockefeller Center.